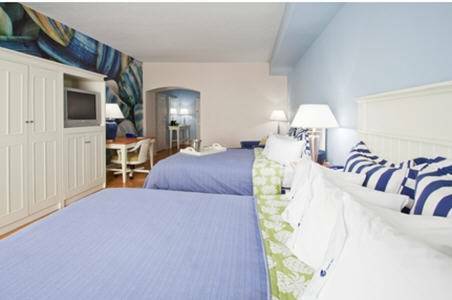 Located in Sarasota's Rosemary District, walking distance to downtown and minutes from the beach, the Hotel Indigo Sarasota hotel invites a closer look. Rent one of our Hotel Indigo bikes and spend some time at the Downtown Farmers Market or cruise over the Ringling Bridge to St. Armands Circle, then take a refreshing dip in one of our hot and cold spa-inspired wading pools. In your room, youll find a water carafe to quench your thirst at our hydration station. The H2O Bistro provides a warm atmosphere for drinks and socializing, while serving specials highlighting the freshest local ingredients. Stunning murals scattered throughout the hotel reflect our neighborhood story, and we also offer three rooms for business or social gatherings and events. We offer pet-friendly rooms and complimentary Wi-Fi so that you can relax with all the comforts of home while we take care of the little details. H2O Bistro Bar: The H20 Bistro Bar serves specialty beer & wine from our local area and from around the world. We also have a full liquor selection and specialty cocktail menu. SRQ Boardroom: Executive Board Room with a permanent table and 8 High Back chairs . 275 sq. ft of meeting space with 10' ceilings. Large bay window. Van Wezel Performing Arts HallSet along Sarasota's beautiful bayfront, the landmark Van Wezel Performing Arts Hall has been entertaining audiences with a variety of music, dance, theater and comedy for more than 35 years. Located accross the street from the hotel. Ringling Museum of ArtThe Museum of Art, built by John Ringling to house his personal collection of masterpieces, today features paintings and sculptures by the Old Masters including Rubens, van Dyck, Vel zquez, Titian, Tintoretto, Veronese, El Greco, Gainsborough and more. St. Armands Circle/Lido KeyLounge in the atmosphere, savor the delicacies created by master chefs, indulge in the vintage wines. Fulfill your shopping passions with fashion elegance and fine collectables. Soak up the sun and enjoy Lido Key's beautiful white-sand beaches. Downtown Main StreetMain Street in downtown Sarasota boasts dozens of boutique shops, restaurants and nightclubs. There are special events throughout the year, including live music, art festivals and parades. The best part is, Main St is walking distance from the hotel! Selby Botanical GardensThe 9.5-acre bayfront property is an open-air and under-glass museum of 20,000 + colorful plants. There are many distinct garden areas with lush rain forest atmosphere. Also on the grounds is the former Christy Payne Mansion. Siesta KeyBlessed with the world s finest white sand beaches, unique restaurants, shopping and nightlife, Siesta Key offers a unique ambiance for visitors. Enjoy outdoor activities, such as fishing, kayaking, snorkeling, scuba diving, shelling or even parasailing! Mote Marine AquariumAt Mote, you can explore the secrets of the sea through touch pools, working labs and high-tech interactive exhibits. See sharks, dolphins, manatees and sea turtles, along with more than 100 other species of marine life. Ed Smith Stadium - Orioles Spring TrainingHome of the Balitmore Orioles Spring Training, Ed Smith Stadium is the premier sporting venue in Sarasota to experience the thrill of the game! Circus SarasotaActs from around the world. Family entertainment at it's finest.